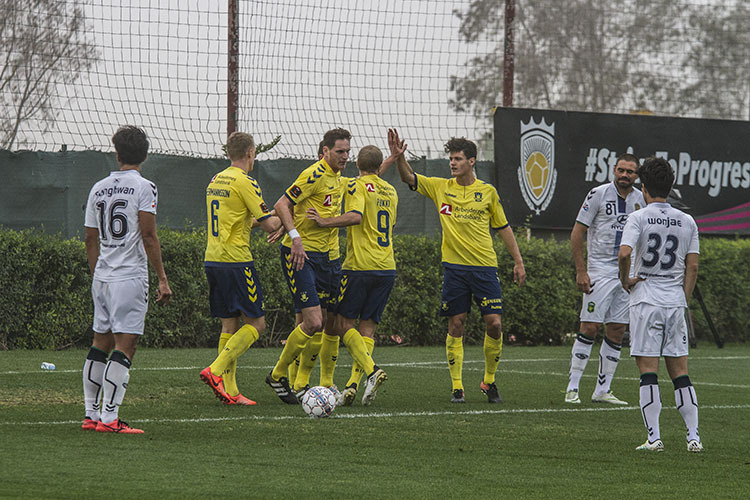 The strong wind was on Brøndbys side in the first half, two goals from the Polish striker Kamil Wilczek gave the Danish side a comfortable lead before Jang Yunhos header got the Asian Champions back in the game, but just before halftime Teemu Pukki scored the third for the Danes. After the break Jeonbuk scored again five minutes from the end, by that time Brøndby was reduced to 10 men after Christian Norgaard was sendt off in the 74th.min. Just before the end Rezan Corlu scored a great goal to end the match in a 4-2 win for the Danes. Brasilian on the scoring list for Jeonbuk. Teemu Pukki pleased with the performance.